Fabreeka bearing pad is the original fabric reinforced, elastomeric bearing pad developed in 1936. 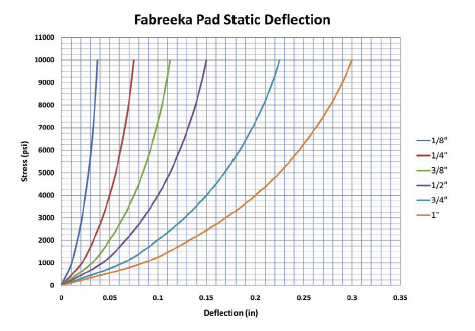 Fabreeka pad is used to eliminate concrete spalling by compensating for construction irregularities such as rotation and non-parallel load bearing surfaces. Fabreeka bearing pad also prevents electrolytic action between dissimilar materials in construction. The preformed bearing pads can also be provided with a Teflon® surface for use in expansion bearings and pipe slides. Fabreeka pad is scientifically constructed to give years of service under the most severe operating conditions. Bearing pads can withstand compressive loads perpendicular to the plane of laminations of not less than 12,000 psi before breakdown. Bearing pads meet AASHTO standard specification for preformed fabric pads. Bearing pads meet D.O.T. and federal specifications for preformed fabric pads and bedding of masonry plates. Other thicknesses are available by simply combining and bonding the above standard thicknesses. Thicknesses shown are nominal. Please contact us International for manufacturing tolerance values.